THCServers Review 2019: Is THCServers a Good Hosting? THC Servers has been providing shared hosting since 2013. Its SSD-based feature-packed plans are affordable, but you need to sign up for a year to get the best prices. THC Servers is a relatively young hosting company that has attracted more than 15,000 customers since its founding in 2013. Its servers are located in Romanian, French and Canadian data centers, and its informative website is in English. CloudLinux is used for its excellent isolation of hosted users. SSDs are employed for disk read/write speeds up to ten times faster than traditional hard disks. The infrastructure is fully redundant, with no single point of failure so THC can offer an above-par 99.99% SLA. All shared hosting plans come with substantial resource quotas including unlimited disk space, unmetered bandwidth, unlimited MySQL databases, FTP accounts, and subdomains. You also get several value-added features for free, such as a website building tool with more than 170 templates and the Softaculous one-click installer for more than 300 programs. Experts get the usual Linux tools: FTP, MySQL, phpMyAdmin, remote SQL connections, Cron jobs, and support for various versions of PHP. But for SSH access and other programming languages, you’ll need to consider a VPS plan that provides full root access. THC’s hosting plans are good value for money, but you need to commit to a one-year term to benefit from the best prices. If you’re afraid of making an annual commitment, you might take comfort from the 30-day money-back guarantee that gives you some time to change your mind. Unlike many hosting providers, the price stays the same when it comes time to renew your contract. You also get a free SSL certificate with your hosting, but domain registration costs extra. You can access THC’s “legendary” 24/7 customer service by live chat, ticket, telephone, and email. 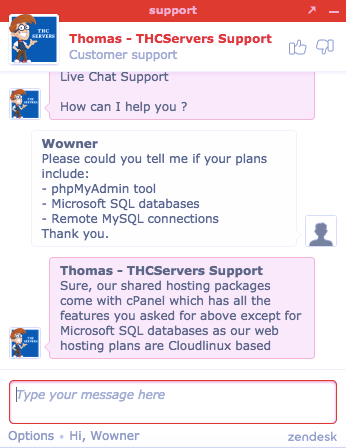 I tried the live chat several times on a Monday morning. Each time, the helpful operator picked up instantly and answered my questions in full. If you like to support yourself, you’ll like the well-stocked knowledge base on THC’s website. onClick="trackClickout('event', 'clickout', 'Vendor Page - Visit User Reviews', 'THCServers', this, true);"
THC Servers has been in business since 2013 and has since grown to have more than 15 employees and 21,000 registered domains. If the shared hosting plans don’t give you everything you need (such as SSH access), you can choose a VPS plan instead. Wondering how THCServers stacks up against other Web Hosting companies? Enter any other Web Hosting company and we will give you a side-by-side comparison.